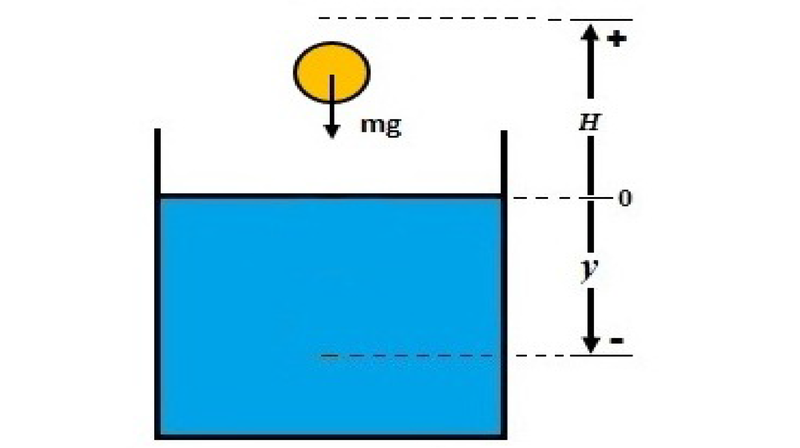 In the course of General Physics it is possible to find the problem related to the study of the motion of bodies in a liquid when their densities are greater than that of the liquid. A problem not found in the bibliography consulted is: What depth will be obtained for a body when it fall freely from a height H above the free surface, if you density is less than that of the liquid? To carry out the study of this problem, a theoretical model was applied and an analytical solution was found to this depth. In addition, an experiment was designed based in the video analysis technique, using Tracker for Windows to know the real depth obtained. The main goal of this paper is to estimate the energy interchanged in the impact of the body onto the surface linking both results. PAJÓN-SUÁREZ, P.; PÉREZ-RUIZ, O. A.; PÉREZ-LORENTI, O. A.. Energy Exchange in the Impact of a Sphere with a Liquid Surface. Revista Cubana de Física, [S.l. ], v. 35, n. 1, p. 15-18, july 2018. ISSN 2224-7939. Available at: <http://revistacubanadefisica.org/index.php/rcf/article/view/RCF_35_1_15>. Date accessed: 19 apr. 2019.